MusiCaps are constructed using separate layers of premium foil and polypropylene films, rather than the vapor deposited, metallized film used by most other manufacturers. Film-plus-foil construction requires more costly materials and result in MusiCaps being approximately 100% larger than typical metallized-film capacitors, yet the benefits are immediately discernible. MusiCaps provide a dramatic improvement in clarity, focus and dynamics when used in critical new designs, as an upgrade to existing tube or solid-state components, or in musical instruments. (Stranded, 22 gauge silver-plated copper leads with Teflon insulation.) Made in the USA. 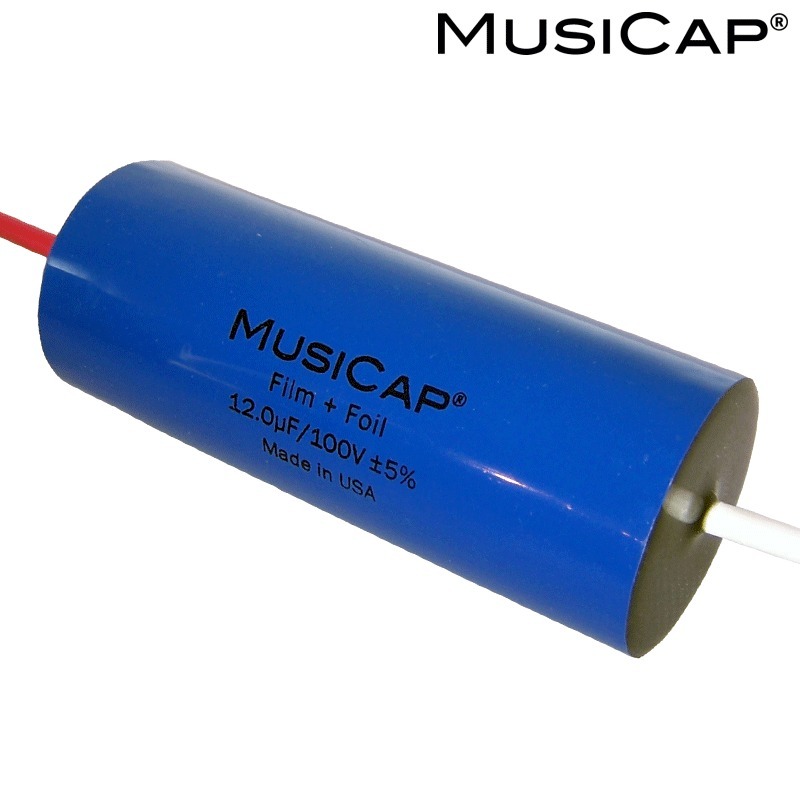 It is with regret that MusiCap have announced that they are no longer making their Musicap Film and Foil Capacitors as a result of increased production prices and lead times for materials used. 1uF to 15uF at 100Vdc - Ideal for loudpeaker crossover applications, with thick multistrand leadouts measuring 2mm internal diameter, 3.7mm external diameter and 105mm in length. 2.2uF to 5uF at 200Vdc - Leadouts measuring 0.7mm internal diameter, 1.4mm external diameter and 65mm in length, solid core. 0.1uF to 2uF at 400Vdc - Great for signal work in valve equipment, leadouts measuring 0.7mm internal diameter, 1.4mm external diameter and 65mm in length, solid core. 0.022uF to 0.47uF at 600Vdc - Great for signal work in valve equipment, leadouts measuring 0.7mm internal diameter, 1.4mm external diameter and 65mm in length, solid core. 0.022uF to 0.047uF at 1000Vdc - Leadouts measuring 0.7mm internal diameter, 1.4mm external diameter and 65mm in length, solid core. 0.01uF at 1600Vdc - Leadouts measuring 0.7mm internal diameter, 1.4mm external diameter and 65mm in length, solid core.